Starmaker Howard Hawks introduced (or enhanced prospects for) any number of feminine headliners, but what of also-rans that passed before his camera’s gaze and barely registered afterward? Lauren Bacall was the first personality Hawks built from the ground up, and To Have and Have Not would contribute to the director’s mystique as much as her own. Columnists from here on recognized Hawks as finder of talent as well as reliable source for commercial hits. You could say it was destiny random and unpredictable that elevated Bacall over supporting women in To Have and Have Not and The Big Sleep, or consider decks ultimately stacked in her favor, with competitors diminished to assure her pride of place. Editing detours and a level playing field might have given Dolores Moran To Have and Have Not and Martha Vickers The Big Sleep, but that would not have suited ambitions and sales plans that called for an overnight sensation in the person of Lauren Bacall. Here was fascinating instance of a star being born (or manufactured) in a hurry, while others with as much ability were left curbside to manage on what was left of contracts that would not be renewed. There were no more perfectly realized boxoffice engines than To Have and Have Not and The Big Sleep. They entertain as efficiently today as when both filled theatres over many decades ago. We know more of their evolution thanks to production histories that stress romance and intrigue that brought them into being. TCM intros become subtext for viewers to reflect upon as vintage films unspool. 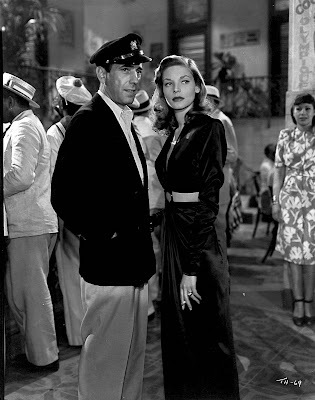 People look at To Have and Have Not and ponder Humphrey Bogart falling in love behind the scenes with Lauren Bacall, not the characters and whether or not they will come to the rescue of Free France. It helped also to have Bacall willing and able to come on broadcasts and give confirmation of legends fans didn’t want to let go of (her passing, like so many of old Hollywood faces, puts us at greater distance from a Classic Era). The stories have been told and retold into decrepitude. All of principals who were there are gone now. To maintain fascination with To Have and Have Not and The Big Sleep means unearthing new information (too late and the lake’s been dredged) or reconsideration of what has been ignored or overlooked. Lately I’ve pondered the fate of Captivating Dolores Moran, a skyrocket that launched with Bacall, sputtered during ascent, then fell to earth. Rescue and recovery were not forthcoming. Moran died in 1982, well after To Have and Have Not was anointed by Bogart/Hawks cultists. No one, to my knowledge, ever sought her out. Besides, it’s the winners you go to for history lessons, which she was anything but, being dismissed by Bacall in her memoirs and defamed by a disgruntled Howard Hawks (ex) wife who referred to her as Dollarass Moron. She came within sniffing distance of the brass ring Bacall took, but dangled also before Moran if a finished To Have and Have Not is any indication. But for serendipity and worse luck, Dolores Moran (and later Martha Vickers) might have been among Hawks women we would recall most vividly. Who was the girl, Steve? The one who left you with such a high opinion of women? Dolores Moran was to provide the answer via a substantial role inspired by Rita Hayworth in Hawks’ Only Angels Have Wings, the director’s most fully realized template so far for action adventure. Moran would be the woman in Bogart’s past, much as Hayworth had been for Cary Grant in 1939. Ingrid Bergman had but a year earlier performed similar duties in Casablanca, a blueprint for Bogart vehicles to come and a model for what went into To Have and Have Not. Triangulated romance was easiest to sell. 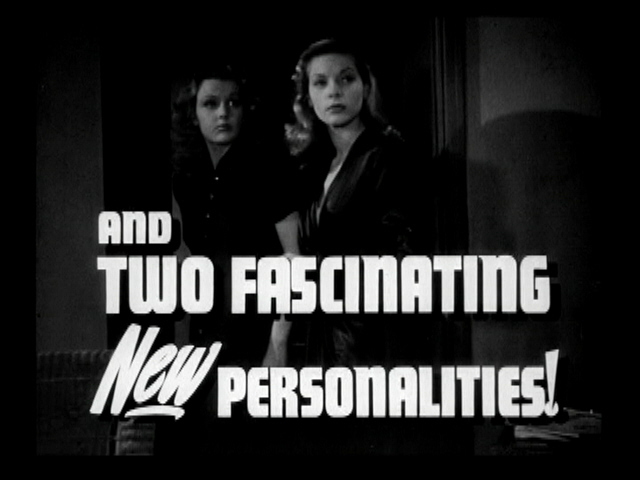 Early Warner publicity foresaw a Battle Of The Blondes as Lauren Bacall and Dolores Moran received equal emphasis in press releases. Which would Bogie choose? Billing was to have favored Moran. She had been at Warners since November 1941 and captured notice with a good supporting role in Old Acquaintance with Bette Davis. Moran's age upon signing with WB remains a mystery. Sources indicate she was born in 1924, but the likelier date is 1926, based on 1941 press originating from home environs where other girls aged fifteen were quick to organize fan clubs for one of their number who had clicked in Hollywood. Did Warner publicists adjust the birth year? Whatever the case, both she and Bacall were teenagers enacting very adult roles, the latter recently turned nineteen when To Have and Have Not began production in March 1944, and Moran possibly a year younger. Bacall claims to have been a babe in the woods when she arrived in California. Moran had traveled a gravel road choked with girls possessed of talent and looks at least approaching hers. Most days were spent cheese-caking for fan press, then ducking woman starved service personnel at camp shows. Sordid realities of these was described in a recent book by Henry Somers, A Subway Ride To The Pacific, where he tells of Dolores Moran put through paces when she tried to do her act on his base. This was a dog’s life for starlets, particularly one barely old enough to have a driver’s license, but for Moran, greater disappointments were to come. Howard Hawks tested both actresses for the part of Marie (later "Slim") at the end of 1943. Bacall was under personal contract, so naturally he favored her over Moran, enough so to shoot and reshoot his protégé’s audition. Bacall writes that Dolores Moran was imposed upon Howard Hawks for the second female lead, a quid pro quo in exchange for Bacall getting the preferred part of Marie. 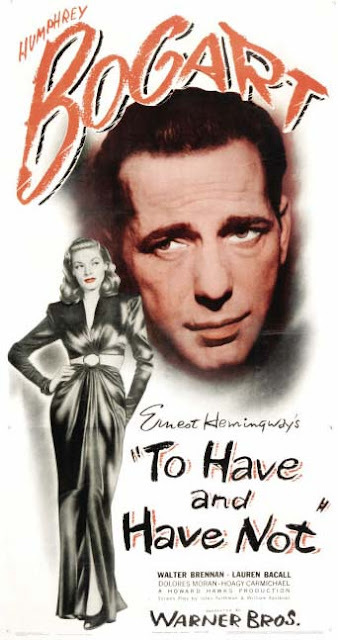 The second revised final script going into production still called for both women to spar romantically with Bogart, even though Moran’s Hellene de Bursac had by now taken second chair to Bacall’s Marie. Shooting was chronological due to constant script revisions by William Faulkner. Private intrigues would finish the job on Dolores Moran that writers had started. As Hawks owned Bacall’s contract, he figured that included her personal services as well. 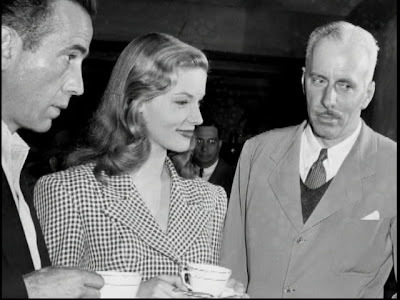 The blow-up that occurred when he realized she was falling for Bogart resulted in a threat to sell Bacall to lowly Monogram Pictures and an affair conducted possibly in spite with Dolores Moran. Parallels between Hawks/Bacall and Hitchcock/Tippi Hedren are unmistakable. Producer use of neophyte talent could be an ugly process, and pantheon sitters we revere freely took advantage. Several decades past death and/or retirement finally got at some truths a lot of us could have done without, but all too human failings and now-and-then bad behavior are, after all, what made a showbiz world go round. Considering temptation daily laid before them, I don’t wonder that Hawks and Hitchcock took unfair liberties, but consider tender age of these girls being passed among middle-aged consorts. Bacall was nineteen to Bogart’s forty-four, while Hawks was forty-seven to Moran’s supposed twenty (but more likely eighteen). Wives became aware, of course, and hell was generally to pay. Real-life Bacall inspiration (and actual discoverer of same) "Slim" Hawks was the spouse after whom Howard molded all his femme creations after To Have and Have Not. Steaming yet when she penned her life story in the late eighties, Slim got even with a deceased Hawks and "Dollarass Moron" by outing their alleged involvement, but what could it have mattered once the book was published in 1990, as all the principals, including the author, had passed on. Production on To Have and Have Not would last nine weeks, ending in May. Hawks made changes on the set and continued paring down Dolores Moran’s part. The shooting script allowed for strong moments yet between Bogart’s character and hers, but few of these survived. Moran is late arriving on screen by fifty-five minutes, so her presence is limited to a second half. A provocative scene had Madame de Bursac coming to Harry Morgan’s hotel room to take a bath, then donning his robe as they discuss leaving the island together. He calls her "Cheesecake" and doubts she’ll stay with a husband they both consider weak. I’ll never leave him, she says, just before Harry kisses her and advises Never say never. 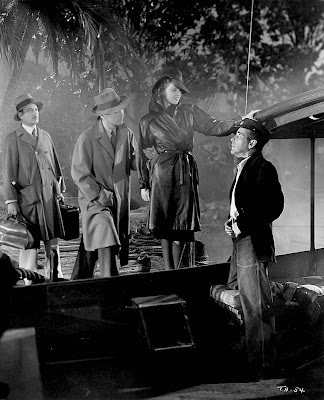 As with Casablanca, suspense turns on who the freedom fighter’s wife will end up decamping with … the husband or Bogart. All this content was regrettably dropped. For all her self-described naivete, Bacall wasn’t napping. Advised of continuing Warner efforts on Moran’s behalf, she arranged for a studio photographer to take several rolls with a cooperative Bogart in her embrace. Their relationship, it seemed, would cement the co-starring position for Bacall and eliminate Moran as meaningful competition. Her 1978 By Myself (since updated and republished) further told the story Bacall’s way. 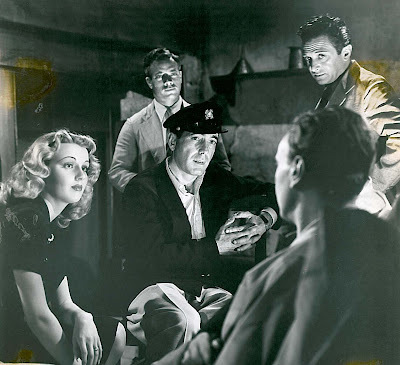 Halfway into the film, Howard (Hawks) ran some of our scenes cut, showed them to Bogie, and with Bogie's help had come to the conclusion that no audience would believe anyone or anything could come between Slim and Steve. So scenes were adjusted accordingly and all of mine made stronger and better. Never mind possibilities of Dolores Moran giving her a run for the money in To Have and Have Not, for Bacall’s summation was a terse You can’t beat chemistry. Poster art would confirm the winner. Bacall was all over one-sheets and declared an overnight sensation as planned. Bringing up drag and summoning memories of the campaign now abandoned was a theatrical trailer (included on the DVD) in which Bacall and Dolores Moran share honors as Two Fascinating New Personalities, with footage and hyperbole divided evenly between the two. 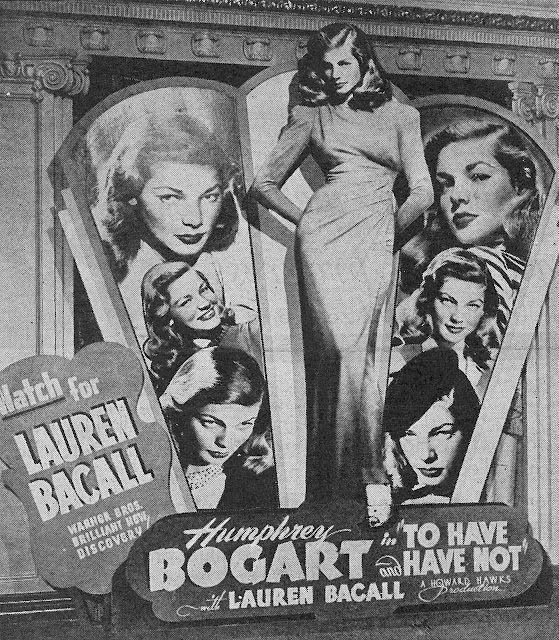 Now with their hit in theatres, Warners put all of merchandising effort behind Bacall (note the extravagant lobby display shown here). For career advancement she had to look forward to with WB, it might as well have been Dolores Moran making the trip to Monogram. Second fiddles would be the only instruments she would play henceforth. You’d scarcely know this actress had participated in a success so big as To Have and Have Not, for now her name appeared far down in cast listings. Within two years, The Man I Love carried Ida Lupino and newcomer Andrea King above the title. 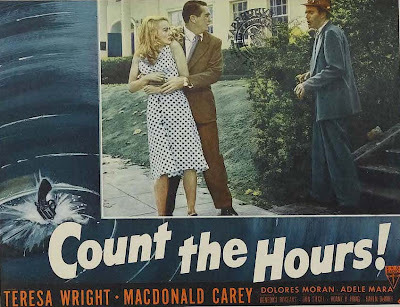 Dolores Moran was not mentioned among pressbook ads, yet she has a part in the film, if minor. Slippage to "B’s" after Warners let her go was expected (here in one, Count The Hours). She got out altogether in 1954. I wonder if anyone even mentioned Howard Hawks or To Have and Have Not to her during the final decades of Dolores Moran’s life. Hawks lived until 1977, but interview references to Moran were dismissive. Was she not good enough, as he might put it, or was she too good for Bacall’s good? Terrific as it was/is, would To Have and Have Not have further benefited had Dolores Moran been permitted to run an even race with Lauren Bacall? Martha Vickers would confront the same question, under similar circumstances, when she worked with Bacall and Hawks in The Big Sleep. More to come on this in next week’s Part Two. It seems to me that Dolores Moran should have won out over Lauren Bacall since Dolores did have the affair with Hawks. What happened to make Hawks suddenly favor Bacall and squeeze out Moran? Great post. Really sheds light on how these "classics" came to be. Can't wait for part 2. Rita Hayworth = ooh la la! Like the site but this week I cannot save your pages for guture re-reading etc nor those of Vitaphone Variteties that seems to using the same software/design as your page. Any clues??? As a friend of mine puts it, Moran stinks up the picture. Personally, I don't think so. What we see of her character though, she's suspicious of people until they've really helped her. So she's the less sympathetic of the two women to the audience. Scenes of Bogie toying with a wounded guy's wife probably had to be diminished to make him appear more noble than sexual. Hawks had Bacall under contract. That's good for him. She wouldn't sleep with him, not so good. But Bogart fell for her (if he hadn't, Bacall probably would have ended up at Monogram) and the chemistry was there on screen. Hawks couldn't avoid that she was good and had Bogart's support and that all of this was needed to make the film a hit for his reputation and bank account. Hawks left his wife home alone nights to go sleep with Moran. But it doesn't seem to have led to Moran getting any career boost out of it. Was Moran short-changed both in the film and by Hawks? Only she can really answer that. Hawks has Ella Raines under contract too. They probably slept together as well. She had some good roles and is better remembered now. When asked of all of this years later, she remembered her Hollywood years as all a good time. No hard feelings there. I really like your analysis, Louis, and agree with its conclusions. One interesting note: I saw a still in a book once of Hawks in his later years, as in mid-70's, sitting outdoors with Peter Bogdanovich, Cybil Shepherd, and Dolores Moran, so I'd assume the latter was still friendly with Hawks all the way to the end.